The Toq smartwatch isn't so much a retail-ready smartwatch as Qualcomm's vision of what a smartwatch can be. Armed with a diverse portfolio of mobile technologies, Qualcomm began releasing a limited run of Toq watches last year--mostly to show off its energy-efficient, always-on Mirasol display technology. And now Qualcomm has advanced its "living proof of concept" model further by integrating voice dictation into the Toq's text messaging feature. Powered by Nuance's voice-to-text engine, Toq users can now respond to incoming text messages by tapping on a microphone icon, and uttering brief replies. There's really not much more to say about the new voice-to-text feature, which is available Monday via an update pushed by Nuance's smartphone app. Still, when you begin tallying up Toq's innovative features, you see a smartwatch that's quietly pointing the wearables industry in the right direction. First, there's the Mirasol display. Much like e-paper, it leverages ambient, reflected light, and doesn't require an energy-hogging backlight to be visible. But unlike e-paper, Mirasol is a color display. The Toq also charges via a wireless charging station--an innovation that all smartwatches would benefit from. Because USB cables are wack, and proprietary charging cables are worse. I also appreciate the fact that Toq comes with only a small handful of apps. You can check the weather, stock updates and your calendar; see notifications for calls and texts; control music on your smartphone; and track your daily steps care of a built-in accelerometer. And now there's simple voice dictation. It's not an overwhelmingly generous menu of features, but when you're navigating a 1.55-inch wrist-worn display, you really don't want to fuss around with much. 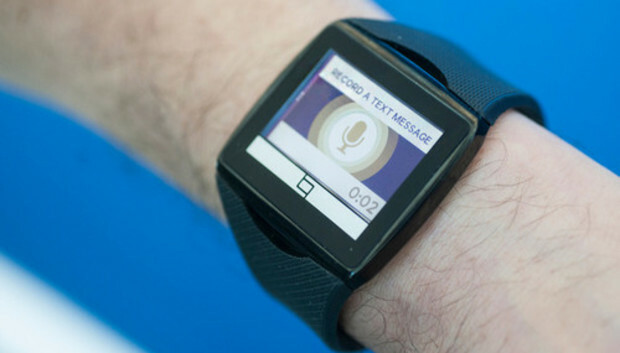 The only other big-name smartwatch company to currently include voice dictation is Samsung. Stay tuned for a look at how the Gear 2 pulls off this trick in an upcoming review.